This month I've purposed to read 10 books that I own and have purchased in the last few months but haven't read. I'm a book fanatic, really. I buy and buy and buy. I also read and read and read. But often not at the same speed. At the end of this month our library is having its annual book sale. In order to get my husband to agree to let me buy MORE books, I agreed to read 10 which I already own. I'm 3 in, with 7 to go! Last year I read the first two books in Lewis's Space Trilogy. I kept starting the final book in the series, That Hideous Strength, but never managed to actually finish it. But now I have! It was, as the first two were, quite brilliant. 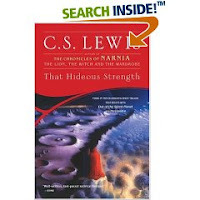 Lewis stated that he does not set out to write moral stories. If morals creep in, they do! However, he did not write for that purpose. He did, however, write about whatever he was thinking about at the time, as most of us are inclined to do. For example, if you are thinking a lot about redecorating your living room, you naturally view everything in light of the colors and decor of choice. Lewis pondered topics, discussed and shared them with friends, and many of those topics landed in his stories. I think That Hideous Strength is an excellent example of the way Lewis's mind worked. His stories were birthed through pictures he saw in his head which then grown on paper. Along the way they picked up and carried various themes. That Hideous Strength takes a satiric look at the Nazis (N.I.C.E. ), morality, marriage, not to mention spiritual warfare. It is, if you will forgive me, an onion of a story in which there are multiple layers of ideas. Lewis was indeed a masterful and artful story teller. I think the thing I value and appreciate the very most about Lewis (and his work) is that he was a great thinker who didn't cross the line. Bear with me here. Many great thinkers of our day somehow, some way and at some point cross the line of intellectual integrity and correct thought into the realms of either a. intellectual snobbery or b. heresy. Having been raised somewhat in a "high church" I've seen this time and time again. You take a Thinker, as Lewis was, and they float away with their thoughts. Wisdom takes a back seat to pride -- and theology drifts off into la la land where no mortal man can truly exist in good conscious without the everlasting fear of hell and damnation. Lewis walked the line between reason and ridiculous very well. His thoughts are deep -- and all together on target. His characters are believable because Lewis understood the human nature that existed underneath exhibited behaviors. Lewis was solid without being scary. Some men take a great thought and twist it into something with which they love to terrify the masses with. Not Lewis. He held steady while dispensing truth. That is a rare man. A true gem. Therefore most any story that he has written (if not all) are truly enjoyable. You can connect with many characters because reality is breathed into them without fluff and nonsense attached. It is artistry. It is beautiful. It is believable. 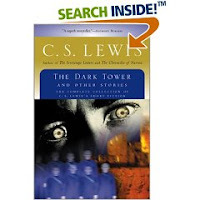 Following on the heels of That Hideous Strength, I read The Dark Tower and Other Stories, also by Lewis. Upon Lewis's death, his secretary visited the house that Lewis shared with his brother. His brother was in the process of feeding a fire with all of Lewis's unpublished manuscripts. This fire is said to have burned for three days. The brother allowed Lewis's secretary to take various writings and diaries. (I CRINGE to think of what was burned!!! GAAA!) Among the manuscripts the story, "The Dark Tower" was found. It is assumed that this was another story of Ransom and meant to follow on the tails of Perlandra. The Dark Tower was not a completed manuscript. Pages are missing and the story left unfinished. But for a Lewis fan, any part of a story is good -- missing or not. Most of the stories in this book are either short or unfinished. To anyone interested in finding out the end of a tale, this book could drive you positively crazy. But for anyone who loves an author so much they'll read anything written by that author, this book is a treasure and a groaner both! Very much worth the time! Good post. I read That Hideous Strength last year for the first time, but I read the first two books about 6 years before, so I'll have to go back and read them again. Good analysis of Lewis. I haven't yet read Dark Tower, but I once saw a whole book written on the thesis that it wasn't actually by Lewis, (which is probably crazy). I like his short story Shoddy Lands, is it in that collection? I came over from Semicolon. LOVED the Space Trilogy, it is among my all time favorite literature. However, I had to come back to That Hideous Strength numerous times before finishing it. I am not certain why. It may be because it is much more British in the writing or perhaps my brain wasn't working with the first two. I have seen lists of people's favorite books and that one shows up quite often. Was quite glad I read it once I did. I've read the first one and loved it, but just haven't found the time to read the other two. I might have to slate them for this year instead of next! I started it about 3 times before I finished it, as well. Oh wow! Took me three tries too. I have no idea why. Curious that it's not just me. Hmm. But it was EXCELLENT! Carrie--loved your thoughtful comment on my post yesterday and your link to your own review cracked me up. I had forgotten about your goal. Stick with it. I am like you--buy, buy, buy--especially used because they might not turn up again.